Taste test: These have very bacon-like taste, thanks largely to the fact that they're cooked in lard. 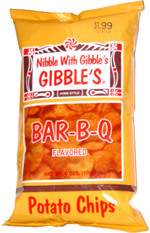 The barbecue taste is good, and lot of lot people liked these, but they have a definite greasy quality to them, like most lard-based potato chips do. The overall consistency of the lard-based chips is much different than your typical potato chip. Smell test: OK, kind of barbecuey, but you can tell from the smell that they're made from lard.